You may have seen articles stating caffeine is bad and advising to avoid drinking coffee; and then other articles indicating that it’s a functional health beverage. More recent research has found that not everyone processes it equally and depending on your genetics, you may be a slow caffeine metabolizer or a fast caffeine metabolizer. If you are a slow metabolizer, you may be more likely to feel negative side effects from drinking caffeinated coffee, including jittery anxiousness and energy crashes. Fast metabolizers can tolerate higher amounts. If you know someone who drinks coffee right before bed, they are probably a fast metabolizer. Mushroom coffee contains medicinal mushrooms shown to improve working memory and even has immune-modulating effects (3). Companies have formulated these dried mushrooms into a powder designed to mix with hot water—similar to instant coffee. The result is a creamy coffee-like beverage. You can buy them with or without instant coffee. Either way, you will be getting less caffeine than from a standard cup of Joe, with improved brain benefits. Cordyceps are a type of medicinal mushroom known to improve energy, stamina, and heart health, and reduce oxidative stress and aging. They were first discovered by observance of animals eating fungus in the wild, and then used by farmers and herders for an energy boost (4). You can find it in mushroom coffee, mushroom tea, or in supplemental form. Matcha is a type of powdered green tea known to create an earthy, creamy beverage. 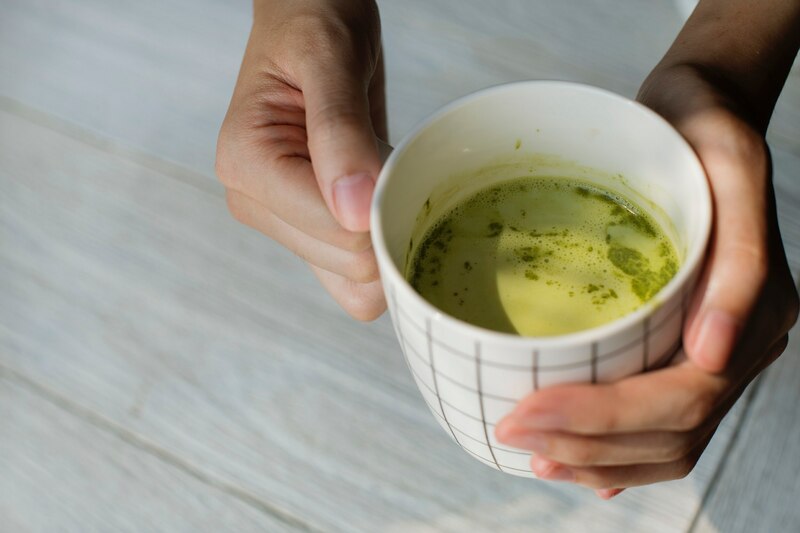 You may have heard of matcha green tea lattes, which are made from matcha powder, a little sugar, and milk—of course you can omit the sugar if you’re okay with its earthy flavor profile. It has a moderate amount of caffeine for a slight energy boost without the crash. Green tea also contains L-theanine, an amino acid phytonutrient that counteracts the cortisol-increasing effects of caffeine, allowing for more calmness rather than spikes and crashes. Fermented Ginseng, an adaptogenic herb, has been used in Traditional Chinese Medicine (TCM) for many years. Specifically, Asian Ginseng (Panax ginseng) is known for creating an uplifting effect for the nervous system while fighting against stress. Some say it can lessen the jittery effect from coffee. An analysis of multiple double-blind and single-blind randomized, placebo-controlled trials revealed improvements in quality of life, cognitive function, and behavior when taking supplemental fermented ginseng (6). Vitamin B12 is partially responsible for DNA and nervous system functioning. If you’re deficient, supplementation or just overall increased consumption of vitamin B12-rich foods may give you an energy boost. One study even showed depression and vitamin B12 deficiency to be linked (7). Animal products, including fish, meat, poultry, eggs, and dairy products, all contain vitamin B12. If you are looking for the highest quality Vitamin and Mineral Supplements personalized for you, please go to www.personanutrition.com and take our online questionnaire providing individualized vitamin and mineral recommendations. Persona is the only Science Based supplement provider on the web today! Take advantage of our knowledge and use it to your health’s benefit! Vitamin B12 Deficiency Can Be Sneaky. Harvard Health Publishing Harvard Medical School. https://www.health.harvard.edu/blog/vitamin-b12-deficiency-can-be-sneaky-harmful-201301105780 Accessed October 31, 2018. Vitamin B-12. Mayo Clinic. https://www.mayoclinic.org/drugs-supplements-vitamin-b12/art-20363663 Accessed October 31, 2018. Phan CW, David P, Sabaratnam V. Edible and Medicinal Mushrooms: Emerging Brain Food for the Mitigation of Neurodegenerative Diseases. J Med Food. 2017;20(1):1-10. Link R. Cordyceps … the Medicinal Mushroom. Dr. Axe. https://draxe.com/cordyceps/. Published September 23, 2018. Accessed March 29, 2019. 2. Bach HV, Kim J, Myung SK, Cho YA. Efficacy of Ginseng Supplements on Fatigue and Physical Performance: a Meta-analysis. J Korean Med Sci. 2016;31(12):1879-1886. Geng J, Dong J, Ni H, et al. Ginseng for cognition. Cochrane Database Syst Rev. 2010;(12):CD007769. Penninx BW, Guralnik JM, Ferrucci L, Fried LP, Allen RH, Stabler SP. Vitamin B(12) deficiency and depression in physically disabled older women: epidemiologic evidence from the Women’s Health and Aging Study. Am J Psychiatry. 2000;157(5):715-21.